You can go winter ice skating outdoors, even if it’s 90 degrees outside! 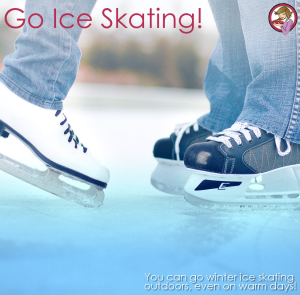 Outdoor ice skating rinks are the perfect place to hang out with friends and family, enjoy a first date, or sign up for skate lessons. Many even have private cabanas where you can hold a special event. Maybe you’re lucky enough to live near a frozen lake for ice skating, but if you don’t, just do a google search for outdoor ice skating rinks to find one near you. How do outdoor ice skating rinks stay frozen in the warm weather? It has to do with a substance called propylene glycol, says Willy Bietak, president of Bietak Productions. His company has installed outdoor rinks at Pershing Square in Los Angeles, California, and by the Queen Mary in Long Beach, California.